The first game I played on the Playstation 3 was Killzone 2, and I still fondly remember my reaction to the new generation of shiny graphics. Both the single player and multiplayer parts of the game are fantastic, the world in which the game takes place is fascinating, and I had a truly wonderful time beating up Space-Cockney-Nazis. For all its strengths, there was one little noise that really added joy to the murder of multiplayer. Most First Person Shooters I’d played confirmed a kill with a written confirmation or a “+50 points” sign, but I had never before seen a game that gave a gleeful chirp for each take down. It’s tone is a little out of place, but I love the fact that it’s there. It’s like a teenie, tiny person is cheering me on to victory. I found another excuse to talk about my favourite game! Yay! I’ve already waxed lyrical about the SOTC in more than one blog. I adore everything about this game, and this small, unnecessary animation just adds to the love. 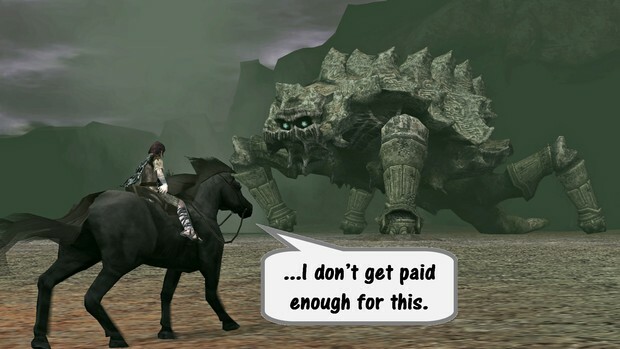 Aside from riding Agro around into near-certain death, the player can give the horse and affection stroke. Shadow of the Colossus is a game full of wonderful little details, and this particular feature is quite endearing. There’s no reason for petting Agro and there’s no benefit to treating your steed with love. But the game let’s you do it, because of course we want to pet the horsy (I like to think that it’s the main characters way of quietly apologising for the mess he’s got them into). So many hours of my young life were dedicated to playing Warzone 2100. This post-apocalyptic, Real-Time Strategy game had me hooked. For me the greatest part of game was the way in which you could design your own tanks from the parts you ‘scavenged’ during the story. There were hundreds of combinations to be found from mixing the various weapons, chassis and tracks. That, and you could build hover tanks. There’s a little piece of this game that has held fast in my imagination for years. When the game first opens out onto the nuclear wasteland that was once earth, you first opponents are unruly, unorganised scavengers. The first real challenge you come up against is a group who call themselves the ‘New Paradigm’. It’s only a small part of the game, but I have always loved that name. The simple, faceless introduction of this group is incredibly brief, and you never learn much more about them after that. Yet there’s something about their title, and the way that the group addresses your existence that has stuck with me every since. The cold, semi-sythesised voice declaring that “you are in contravention of the New Paradigm”, has always made me smile. 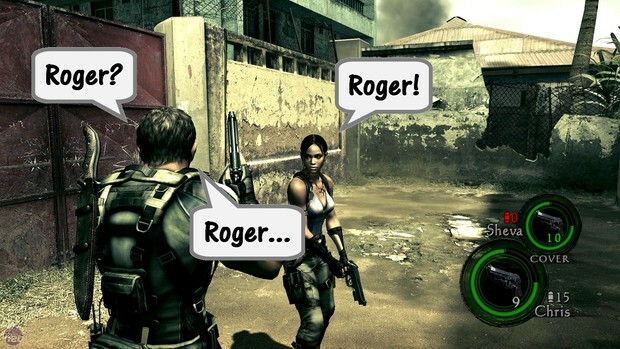 Resident Evil 5 – who is Roger? The main characters of Resident Evil 5 miss their friend. His name is Roger, and wherever Chris and Sheva go, they are always trying to find him. If you press the button to call your partner, they might call shout for them by name, ask for assistance, or call out for this mystery character. If you and your co-op companion hit the button repeatedly for no good reason, it soon becomes clear that these two heroes really miss their friend. One day, I’d love to find out who Roger really is. Despite all the zombies and bat monsters, Chris and Sheva are always talking about him. He must be a really great guy. Videogames do great things with loading screens these days. Assassin’s Creed and Bayonetta are two superb examples, allowing the player to move the protagonist around the screen whilst they wait, practicing for what awaits. In the case of Baldur’s Gate: Dark Alliance, the loading screen is also interactive… though not quite to the same level. 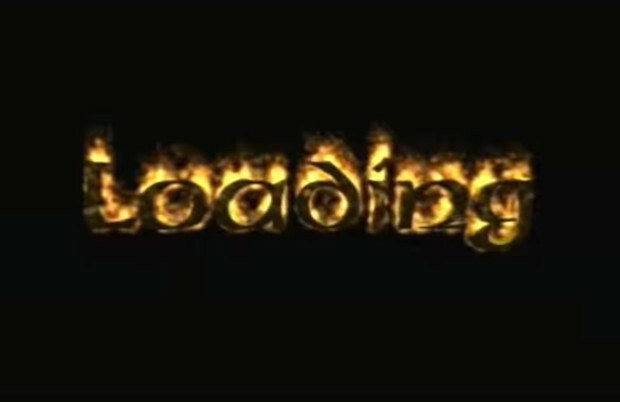 The games loading screen has the word ‘loading’ etched onto it. I think we can all agree that this makes sense. The word has been set on fire by someone irresponsible, and the text will burn bright until the game is ready to proceed. Should the player move the analogue sticks while they are waiting, they can move the fire. It’s as underwhelming as it sounds, but it’s a part of the game that has stayed with me. There was something quite cathartic about the brushing and swirling of the flames. It took the edge of waiting for the game to load, and calmed the frayed nerves after a crushing defeat. Every time I lose a race, I find myself beaming at the sulky noises Yoshi emits. He sounds like a little child that’s been told there’s no more ice cream left. It’s almost worth deliberately losing a race to hear he’s sad little warble. Almost. It’s the little parts of a game that can stick with us long after the major plot and gameplay elements have faded from memory. Sometimes it’s a word or phrase, others times it’s a sound effect, or a tiny game feature that entertained you. Even the most highly polished games need those little quirks if we are to embrace them. Can you think of any small game elements that are as memorable or remarkable as the entire game they were in? Is there something on this list they you agree with? Leave a comment below, and let’s give thanks to the little things in videogames. This blogpost was inspired by all the great “Giving Thanks” themed articles in the Destructoid Community Pages. If you want to read some more great gaming nostalgia, you should really pay a visit. I don’t know how you handle Yoshis voice insistently. He’s better in small doses it seems.